Maybe it’s my American nature or just the gluttonous aspects of my character that lead me to take things a bit too far. I LOVE cheese in pizza crusts. I always ask for more Ranch dressing when it comes to chicken tenders and I believe that frying is the tastiest way of cooking things. topped with onion rings wouldn’t hurt either…. WITH a spicy, cheesy center. These beautiful monstrosities otherwise known as Armadillo Pork Burgers taste like overabundance, freedom and decadence. In a word, they taste like A’Merica! Take a green chile, stuff it with cheese, wrap it in pork, fry it or grill it, coat it in BBQ and put it between a burger bun. God Bless the USA and God Bless this burger! Cut up pork into small pieces and add to a food processor with thyme, sage, marjoram, onion powder and smoked paprika. Add a splash or two of beer and pulse until minced together and sausage meat has been formed. Remove from the food processor and transfer to a large mixing bowl. Add egg and breadcrumbs and mix until thoroughly combined. Wash green chiles and put under the oven broiler or on an open flame at high heat. Allow to cook under the heat until skin begins to blister and chile is hot to the touch. Take out chiles and place in a plastic ziplock bag or tupperware container with a tight lid. Seal up the chiles and allow for them to steam. This should take 20-30 min. If you want to skip this process, just buy a can or two of whole green chiles. When chiles are soft and malleable, cut the tops off of them, peel the skin off and remove the seeds inside using your finger. Take a handful of the sausage mixture and flatten it down on a piece of wax paper. Place stuffed chile in the center and gently fold up the meat mixture around it. Shape it to form a patty that envelopes the chile and cheese in the center. If you are lacking in material, simply add a pinch of the meat mixture overtop to seal it all in. You should be able to make 4-6 medium sized patties. You can make these ahead of time and put them in the fridge or freezer for later. When ready to cook, preheat oven to 220C/450F. Coat in your favorite BBQ sauce and cook in the center rack for 10-15 min or until pork is cooked and cheese is melted. 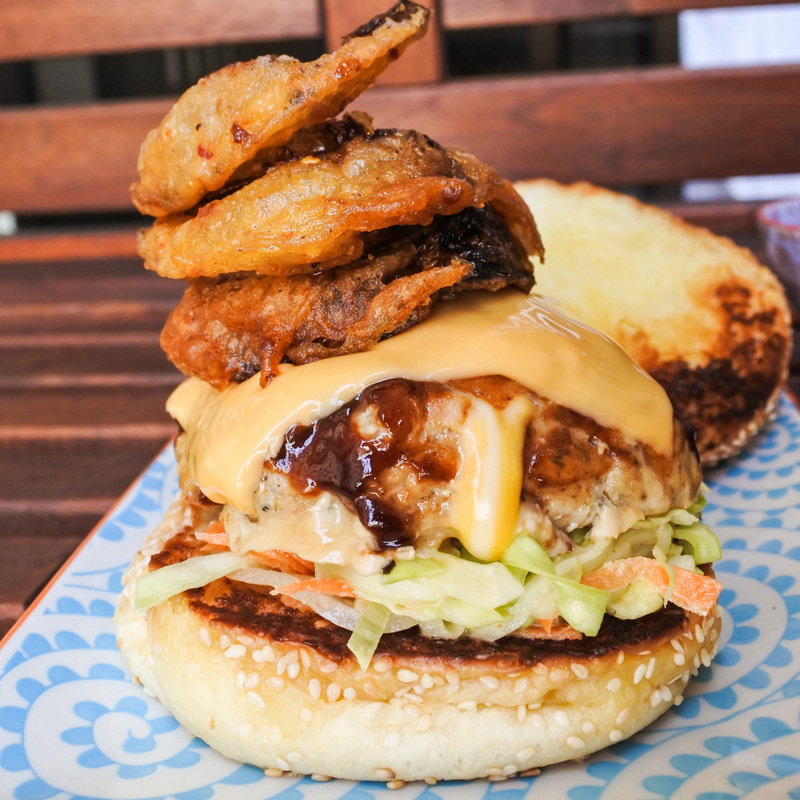 Coat with one last coating of BBQ sauce and place in a toasted burger bun with coleslaw on the bottom and onion rings on top. If you are feeling decadent add another slice of cheese on top. Serve with your favorite side and enjoy!